Looking for a way to bring elegance into your bathroom design? A handcrafted copper sink from Native Trails may be the perfect solution for your design dilemma. 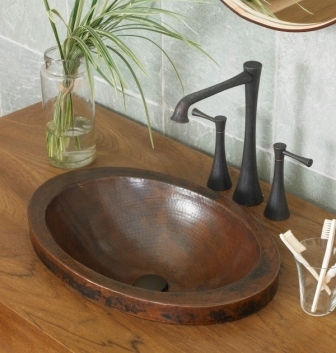 These artisan created, high-quality handcrafted sinks from Native Trails bring an element of understated luxury to the décor of virtually any bathroom design. Definitely not your typical mass marketed bathroom fixtures, the recycled copper sinks created by Native Trails are handmade by skilled coppersmiths. The crafts people heat and soften the metal over an open forge, using an anvil and hammer to slowly and methodically transform the recycled material into a perfectly formed sink. When you use a Native Trails copper sink in your bathroom design, you are actively participating in the green building design movement by utilizing re-purposed materials in the core fixtures of your home. All of Native Trails' sinks are crafted from recycled copper, collected by the artisans who make the sinks. Their skills, diligence, and hard work transforms construction copper, electrical wires, and pipes that might otherwise end up in landfills into elegant decorative elements for home bathroom décor. Native Trails copper sinks can be seen at more than 1100 showrooms throughout Canada and the United States. The company also produces recycled copper bathtubs, along with a line of hand painted copper and nickel Talavera tiles. For more information, see www.nativetrails.net.